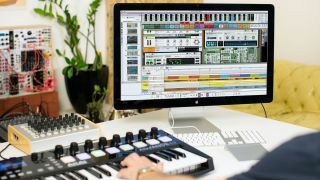 The Reason rack has long been graced with tons of creative instruments and effects, but version 9 brings a new category of device to Propellerhead's virtual studio. Player Devices don’t create or process sound - instead, they handle note data, transforming shabby, uninteresting sequences of notes into inspiring, musically satisfying results. You get three devices to take your piano roll exploits to the next level: Note Echo, Dual Arpeggio, and Scales & Chords. Each is dropped into the rack, placed before an instrument device, where it intercepts the note data that would otherwise have arrived from Reason’s sequencer. Like all of Reason's other gizmos, Player Devices are deep and powerful, so here are seven indispensable techniques to help you get the most out of them. For more Reason 9 tutorials, grab the March edition of Computer Music. Scales & Chords can also be used to make sure your music stays in key. If you activate the Filter Notes switch, any notes that don’t belong in the key you’ve selected on the left won’t be let through. If you leave the switch off, any bum notes will get through in a modified form, tuned downwards to the scale you’ve selected. You may just be using it as a simple note repeater, but Note Echo is a far more flexible device than you might first think. Mastering it is a case of knowing two things. First, you can deactivate any echo in the sequence by switching off the light below it, including the first light - the input note. Second, you can reduce Step Length to 0, and make every single echo in the sequence play at the same time. So, to create chords or instant harmonies using Note Echo, turn up Repeats and change the Pitch to +1, deactivate any notes you don’t want, and whack the Step Length down to 0 so that they’re all playing at the same time. You can also use the humble Note Echo as an instant MIDI transposer. Start by setting Repeats to 1, deactivate the original note, set the Step Length to 0, and just play with the Pitch parameter for instant note shifts. This is also a really easy thing to automate. Scales & Chords can be used to monitor incoming MIDI information. Just switch the scale to Chromatic and make sure everything else is switched off. Now you can check the keyboard in the Chords section of the Device to see exactly what’s happening. This is especially useful if you’ve got a complicated series of MIDI plugins messing with your notes. You can use Direct Record to record the MIDI output of any Player Device, or just click Send to Track to have the data instantly printed. Send to Track will only generate MIDI data between your Left and Right loop locators, so you can just print an echo, chord, arpeggio or anything else to the sequencer for a particular section of your track. Most Player Devices parameters can be automated or linked to MIDI controls to make life easier – but some are more useful than others. We think the best automation comes from the Scale selector, the Note Echo Pitch control, and the Arp on/off switch. Alt-click these controls and flip them on and off in the sequencer between sections to instantly liven up a track. Using Dual Arpeggiator’s Random direction setting is a fast ticket to a quick melody. All the notes will be the same length, but the notes themselves will be random selections from the input notes. To take it further, switch both Arpeggiators’ Directions to Random and set them off at different rates.